These students are preparing to embark on a special journey. They are part of the National Aquarium’s “Aquarium on Wheels” program. Participants create and perform plays at libraries to help educate school-age children about environmentalism and wildlife. But they also take time to do some learning themselves. Today, they are riding out to Poplar Island just off the Eastern Shore of Maryland in the Chesapeake Bay. There they will release a group of diamondback terrapin turtles. The island is a haven to many species of birds and is a popular breeding ground for terrapins. In fact these turtles were hatched here before being taken in for scientific observation, and today, they will return home. 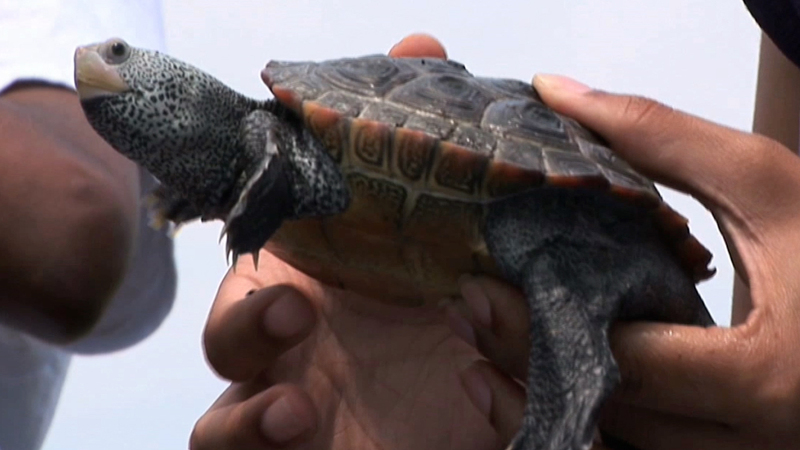 For the past eight months, students have been caring for one terrapin in the classroom. They’ve learned about the terrapins diet and habitat and about threats such as fishing and pollution. Narrator: The turtles have been tagged so that biologists on the island can track their success. And now it is time to bid farewell. Reflecting on the months spent nurturing these hard-shelled creatures, the kids gaze upon them affectionately, getting in one last look before lowering them into the water one by one. Narrator: As the turtles swim away, the students wave goodbye. And though the students have just let these turtles go they take with them a greater appreciation for these animals and the vital role they play in the ecosystem. And this is just one small way in which the National Aquarium and its “Aquarium on Wheels” program help to make a better world for all of us.